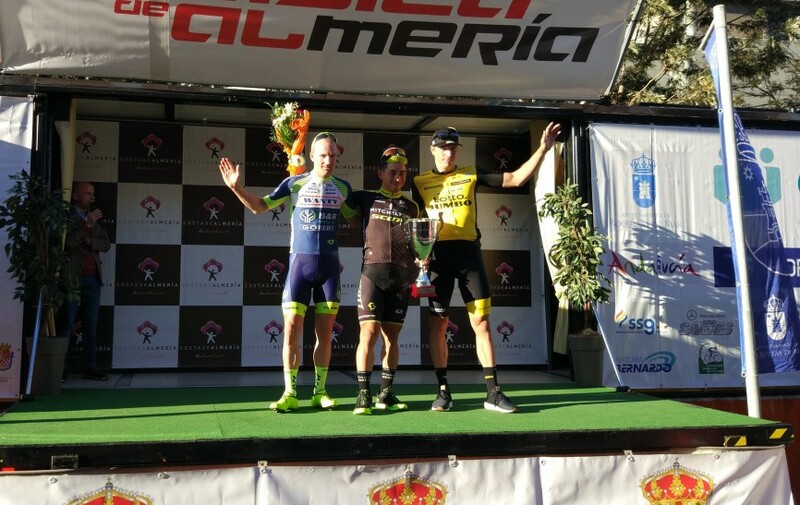 Timothy Dupont took a podium spot in Clasica Almeria (1.HC, 11/02) on Sunday. In ideal weather circumstances the peloton headed for a bunch sprint in the South of Spain. But a crash with five kilometers to go caused some panic. Dupont was held up and was brought to the front by teammates after a fast chase. In the bunch sprint he was the first rider to accelerate, and only Caleb Ewan and Danny Van Poppel could pass Dupont. For our 30-year old rider it is already the third podium spot in the new season. "In the final I was isolated after the crash. Thus I had to move up on my own in the sprint preparation. With 250 meters to go I initiated the sprint, and only Caleb Ewan and Danny Van Poppel, two strong sprinters, could pass me." "I want to double thank my teammates for their terrific work. They kept me in front of the peloton during the whole day and in the final Van Keirsbulck and Offredo brought me back after the crash with only 5 kilometers to go." "Now we are heading to Volta Algarve. Tonight we sleep here and tomorrow a 700km bus ride to Portugal awaits. In Algarve three sprint stages should suit my profile."